It was a sparkling evening of entertainment for the 600 guests who made their way to the Glitz & Glam Gala Jan. 25. As attendees entered Heinz Field Club East Lounge, the sounds of the band Soiree and a glass of wine or champagne greeted them. 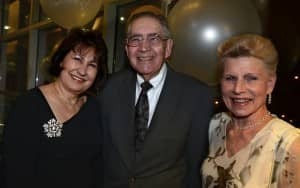 The party to benefit Jefferson Hospital’sWomen’s Health Initiative was chaired by Micki Talarico (with Richard) and Barbara Magnotti (with Bill). WTAE’s Andrew Stockey acted as emcee. Board chair Gregory Harbaugh made a few remarks before dinner but the focus was on the live and silent auction, dinner and a performance by The Unexpected Boys.